RIR got in touch with former Minister of Education Vladimir Filippov to discuss how Russia has been adjusting to the Bologna Process that started in 2003. On Nov. 17, 2011, the website of the newspaper Izvestia posted an article on the decision of the Russian Ministry of Education and Science to reform the academic degree system. Izvestia quoted Elena Nechaeva, director of the Ministry’s Department of Scientific and Pedagogical Staff, as saying that there were plans to abolish the Candidate of Science degree in the next two years. Russia & Indian Reports’ Olga Gorshkova spoke with Vladimir Filippov, the rector of Peoples’ Friendship University and a former Minister of Education who led Russia’s accession to the Bologna Process in 2003 about the changes. Russia & India Report: The new reform of academic degrees is a continuation of the reform you initiated back in 2003, isn’t it? Read more: More or less a specialist? Vladimir Filippov: This sort of transformation in Russia is a natural process. Russia joined the Bologna Process, which currently has 49 signatories from Europe, as well as from many CIS countries. It is the uniform system of higher education and research personnel training. However, it is a three-tier system [Bachelor’s-Master’s-Ph.D.] rather than a two-tier system [Bachelor’s-Master’s]. Abroad, they call what we know in Russia as a doctor’s degree a Ph.D. Russia started the transition to this system in 2003, when it joined the Bologna Accords, and we now have to complete it. RIR: Does this mean that the Candidate of Science degree will soon cease to exist? V.F. : For decades, Russia has had its own unique system of accreditation and training for academic staff, with two successive degrees – a Candidate and Doctor of Science. Our task is not to abolish the Candidate’s or Doctor’s degree, but to have our Candidates practically and legally be recognized as Ph.D.s. This already works for some academic disciplines – mathematics, physics and chemistry – but we need the same for the social sciences and humanities, where we traditionally award too many degrees and often to those who do not deserve them. As for the Doctor’s degree, the West has never asked us to abolish it. The only thing we want is to have our Candidates recognized globally as Ph.D.s – this will only benefit our students. RIR: What benefits will the new system offer? V.F. : It is in the best interests of most people, now that globalization and internationalization are happening. We know that scientific exchange is very useful, and it is important to encourage our researchers who obtain Ph.D. degrees in the West to come back to Russia to obtain globally-recognized Ph.D. degrees in Russia, and vice versa. In this context, we have to create a system of easy, automatic recognition of our education certificates. This is a global trend that is recognized by the world community. In 2009, the UNESCO World Conference on Higher Education in Paris, where more than 180 countries were represented, declared that all higher education systems would be harmonized based on the Bologna system of Bachelor’s-Master’s-Ph.D. If Russia fails to follow suit, it will be left all alone, so there is no way around it for us. Many countries, including China and some CIS countries, have been sending their students to complete post-graduate programs only at universities that provide Ph.D.s. Chinese students are aware that a Ph.D. degree will offer better employment opportunities. RIR: What will the reform look like in our country? V.F. : When adopting an international system, each country needs to factor in its special features. For example, Russia has preserved the 4+2-year pattern for the Bachelor’s-Master’s system, although many countries have adopted a 3+2-year system. We told our counterparts – education ministers from other countries – that we needed the 4+2-year system, because our students have 11 years of schooling, while theirs have 12 or 13 years. Read more:Where do Indian students meet in Moscow? We now have every chance of modifying our graduate education system [aspirantura] in order to have our Candidates of Science equal Ph.D.s. The Ministry of Education and Science has adopted a four-year postgraduate course. We can also make other changes to the timeframe. When it comes to the structure, we can make amendments to have more exams within post-graduate programs instead of having combined qualifying exams for foreign languages, history and philosophy and a single big, complicated specialist exam. The latter can be split into six or seven smaller exams that postgraduates can take once every semester, as they do it in the West. But the main thing is the level of publications. We have to challenge our postgraduates to publish their work not only in the journals approved by the Higher Attestation Commission, but also in leading global academic periodicals. Among the many benefits of this initiative are the enhanced prestige of Russian academics and the promotion of Russian researchers and publications in the English language. Also, publications in foreign journals confirm the high level and authenticity of research. We will thus comply with all requirements. RIR: A Ph.D. degree means a Doctor abroad. After the reform, will we have two doctoral degrees – ours and theirs? V.F. : A Ph.D. is a Doctor of Philosophy, an outdated name. We will have a Ph.D. degree first and then the Doctor of Science, followed by an Academician. A Doctor of Science degree is an incentive for those who obtain a Ph.D. degree and want to go further in an academic field. In Russia, you cannot become a professor without a Doctor of Science degree, and a Doctor earns 40-50 percent more than a Candidate. Furthermore, a Doctor of Science has a far better chance of being employed abroad than a Ph.D. Statistically, only 10 percent of Candidates in Russia go on for a Doctor’s degree later. That proportion should stay the same. Speaking of which, some countries have academic degrees higher than the Ph.D.
RIR: Why wasn’t the Ph.D. degree adopted simultaneously with the transition to Bachelor’s and Master’s degrees? V.F. : First, because at that time we had the Ministry of Education, and science was supervised by a different agency. Now that we have the Ministry of Education and Science, the transition is possible. Second, it would have been hard to make such a complex change – first, we needed to have a smooth transition to the Bachelor’s-Master’s track and work out new standards, which required lots of effort and time. The final transition had been postponed twice, but on Sept. 1, 2011, the entire Russian higher education system finally adopted the Bachelor’s-Master’s program, so it became possible to think about the next step. RIR: Will foreign degrees also be easily recognized in Russia? V.F. : When our students come back to Russia after completing education programs abroad, they are unwanted on the Russian job market, even if they obtain Master’s degrees. 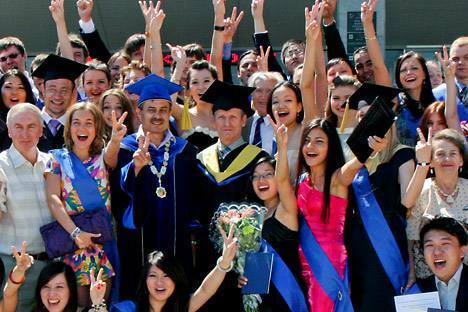 Russian Master’s programs do not accept students with European Bachelor’s degrees, because they completed three-year courses, while we require a four-year Bachelor's program. They have four-year Bachelor’s programs in China, but we still need interstate agreements to accept them. This is why our students often try to complete foreign and domestic graduate programs simultaneously. If they come home with a Ph.D. degree, they can obtain Candidate’s degrees here based on the decision of the Russian Higher Attestation Commission, but on the condition that the duration of the educational programs are equal. RIR: How will employers respond to this transition? V.F. : Their attitude is still distrustful. We have no standards yet to identify which positions require which degrees. All the ministries are working to develop these standards. In the West, only 20-30 percent of graduates of Bachelor’s programs choose to apply for Master’s programs, but the figure is at 70-80 percent in our country – this is a huge waste of time and effort, but many graduates are afraid they won’t be able to find a job, because their Bachelor’s degrees might not be recognized. As a result, the country loses billions, and people lose time and then work in positions that do not require Master’s degrees. RIR: Won’t this reform result in another wave of brain drain? V.F. : We could shut all borders and never let anyone out, and then do everything our own way, but it wouldn’t be efficient. In order to keep academics in Russia, we must provide an adequate standard of living – pay decent salaries, provide housing to young researchers, and, above all, invest in modern equipment; otherwise we will lag behind the entire world. Young people leave looking not only for more money, but also for equipment and opportunities that we cannot offer them here.